Stems: Erect, stout, usually unbranched, hooked- and glandular-hairy. Leaves: Alternate, long-stalked, pinnately 3-foliolate; leaflets lanceolate or ovate-lanceolate, terminal leaflet 2.5 to 4 inches long, 2 lateral leaflets somewhat smaller, leathery, rough with hooked hairs, lower surface with conspicuous network of veins; margins entire. 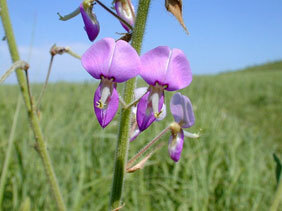 Inflorescences: Racemes, 1 to 2 feet long, usually unbranched. Flowers: Calyces unequally lobed, sparsely pubescent; corollas papilionaceous, less than 1/2 inch long, pink to whitish, fading purplish; banner prominent, often with darker spot near bases; stamens 10, 9 united, 1 free. Fruits: Flattened pods called loments, 1/2 to 1 inch long, with 2-7 egg-shaped to rounded segments, surfaces densely covered with hooked hairs; seeds 1 in each segment, smooth, brown. Habitat: Dry upland prairies, ravines, hillsides, pastures, and roadsides. Forage Value: Livestock will consume young plants of Illinois tickclover, causing it to sometimes disappear from rangeland. Comments: The hooked hairs on the seedpods allow them to cling to clothing or fur, like "ticks". It competes well with native grasses due to its deep roots, rapid growth, and shade-tolerant leaves.